The White Rose Resistance Group | Weiße Rose Stiftung e.V. The White Rose is a circle of friends centered around the students Hans Scholl and Alexander Schmorell. Beginning in the summer of 1942, they write and distribute leaflets calling for opposition to the National Socialist (NS) dictatorship and an end to the war all over Munich. Supporters join the resistance group in other German cities, too, including professor Kurt Huber in late 1942. Seven members of the White Rose resistance are sentenced to death and executed by the NS judiciary beginning in February 1943. Around 60 fellow campaigners are tried in court and some of them sentenced to long terms in prison. Today, the White Rose is one of the best-known German resistance groups. In times of National Socialist terror, they were driven by humanistic motives and appealed to the responsibility of every individual for freedom and justice. Hans Scholl and Alexander Schmorell study at Munich’s Ludwig-Maximilians-University, as do Sophie Scholl, Willi Graf, and Christoph Probst. Sophie Scholl excepted, they all read Medicine. In this time of war, all young male medical students are trained as medics after their basic military training. They are not sent to the front permanently but are assigned to student companies and alternate between study periods and periods serving in military hospitals at or near the front. Willi Graf for instance serves as a medic in Serbia, Poland, and the Soviet Union as of May 1941 and thus witnesses the terrible war of conquest and destruction. It is only in April 1942 that he returns to Munich to continue his studies and meets his fellow students Hans Scholl and Alexander Schmorell. The three of them, Hans Scholl, Alexander Schmorell, and Willi Graf, are ordered to the Eastern front as medics for three months starting on 23 July 1942 along with other friends from the 2nd Student Company. They are directly confronted with the brutal reality of war as ‘assistant doctors’. The friends from the Student Company spend several weeks together on the Eastern front. Even when Willi Graf and Hubert Furtwängler are assigned to a different Infantry Regiment in September, they stay in touch until their return on 06 November 1942. They develop a deep sense of community, speaking, reading, singing together and sharing food. Willi Graf later notes that it is the first time he can share his war experiences with likeminded people. Alexander Schmorell is happy to be back in his family’s former Russian homeland. “The world needs to become different, more Russian”, he writes his parents full of enthusiasm, all the while dissociating himself from Bolshevism as much as from National Socialism. His knowledge of the language helps in his contacts with the Russian people, whom Schmorell, Scholl and Graf approach openly. They forge personal ties with Russians, thus breaching military rules. They refuse to view Russians as enemies, but the NS dictatorship demands unconditional obedience from everyone. The aim of National Socialist education policy is not the free development of the person but their submission to the political objectives of the regime. Even ten-year-olds are sworn to the Nazi ideology within the Hitler Youth (Hitlerjugend, HJ). The students of the White Rose have their own mind. Thinking is essential to them, an inner dialogue and connected with the question of the meaning of life. It means grappling with the political and military situation and confronting it with their own conscience. They oppose “thinking and judging for oneself” to the ideological monopolization of the National Socialists in their 6th leaflet. Reading, including reading banned books, is essential for the White Rose circle of friends. Literature helps them shape their thoughts and opinions. They read alone, in small groups, or meeting in larger groups for reading and discussion. Their notes mention books that mean a lot to them. Among them are the German classics, philosophers of religion, or Russian and French writers. Alexander Schmorell and Hans Scholl write the first four leaflets criticizing the regime in June and July 1942. They produce around 100 pieces of each leaflet in secret in Schmorell’s parents’ house. Among the recipients they choose to send them to are many academics. The two expect support for their resistance among the ‘intelligence’. Owning and dissemination critical writings is strictly forbidden in National Socialism. Everyone is obliged to hand them in to the police. Accordingly, the first four leaflets are reported by approximately one third of the 100 recipients. Upon their return from military service in Russia, Alexander Schmorell and Hans Scholl are even more determined to resist than they had been before. This is when Sophie Scholl, Willi Graf, Christoph Probst, and, in late December 1942, Kurt Huber actively join the resistance. They create the fifth and sixth leaflet together in January and February 1943. Using a new and more effective duplicating machine they can produce around 6000 copies. Paper, envelopes and stamps are rationed during the war. Buying large quantities of those items is suspicious. The students risk their lives producing and distributing the leaflets. Despite this mortal danger, their indignation at the Nazi crimes pushes them to resist. The goal of the group is to convince critics of the regime in other cities to participate in distributing the leaflets. They aim to bring trustworthy friends and acquaintances in Ulm, Stuttgart, Saarbrücken, Bonn, Freiburg, Hamburg and Chemnitz on board. With the fifth leaflet appearing all over Munich, the Gestapo decides in early February 1943 to intensify the search for the authors and creates a special investigative commission. The previous search for the unknown authors of the ‘Leaflets of the White Rose’ had not been successful. The investigative commission initially cannot come up with concrete results of their search. They do not make a connection between the leaflets and the wall slogans at the university. Nevertheless, Oswald Schäfer, director of the Gestapo’s Munich office from 1942 to 1945, places the university under increased surveillance. This also means that all suspicious activity and incidents must be reported immediately. On 18 February 1943 around 11 a.m. the Scholl siblings place copies of the sixths leaflet in front of the lecture rooms in the university’s main building, tossing a stack of remaining leaflets into the atrium. The janitor Jakob Schmid observes and seizes them. Both are immediately arrested by the Gestapo and further arrests follow. By late February most members of the Munich circle are apprehended. Heinrich Himmler orders their family members to be arrested as well, in a common Nazi practice of assuming ‘guilt by relation’ (‘Sippenhaft’). 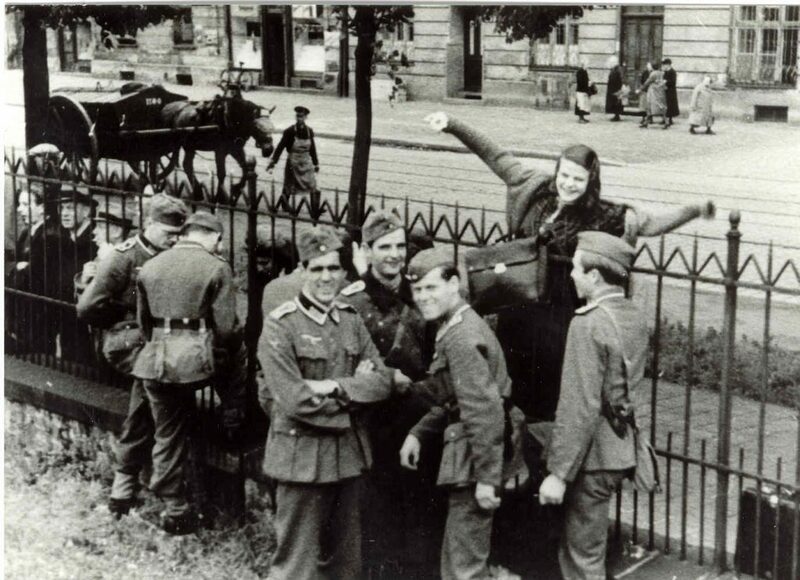 The students and Kurt Huber are expelled from the university, the soldiers discharged from the Wehrmacht so that the trial can be held by the “People’s Court” (‘Volksgerichtshof’), a special Nazi court operating outside of the constitutional frame of law. Sophie and Hans Scholl are interrogated separately. Sophie states that she “does not want anything to do with National Socialism”. At four a.m. the next morning, 19 February 1943, she learns that her brother has confessed and now she, too, confesses. Christoph Probst had been asked by Hans Scholl to draft a new leaflet for the group. Hans Scholl carries that handwritten draft with him when he is arrested and is not able to tear it up unnoticed. Christoph Probst is soon suspected to be the author and is arrested on 20 February in Innsbruck. The Gestapo force him to reassemble his text from the paper shreds during his interrogation on 21 February 1943. Wanted posters are put up in the search for Alexander Schmorell, who is attempting to escape. On the evening of 24 February 1943 he is recognized while hiding in an air raid shelter where he is seized and handed over to the Gestapo. 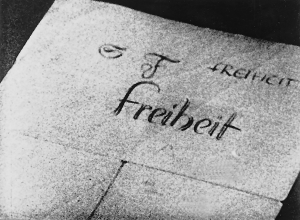 Sophie Scholl wrote “Freiheit”, “Freedom“, on the back of her indictment. As early as 22 February 1943 the ‘People’s Court’ sentences Christoph Probst and Sophie and Hans Scholl to death for “highly treasonous aiding and abetting of the enemy, preparation of high treason and demoralization of the ‘Wehrkraft’ (troops).” The sentences are carried out that same day with the guillotine at the Munich-Stadelheim prison. On the evening of the same day, the student leaders call for a rally in the university in order to dissociate themselves from the actions of the White Rose and to insult them as ‘Traitors to the Fatherland’. The Second trial for high treason against 14 defendants of the resistance group takes place on 19 April 1943. The ‘People’s Court’ pronounces death sentences on Alexander Schmorell, Willi Graf, and Kurt Huber. Ten fellow defendants are sentenced to prison terms, Falk Harnack is acquitted. Relatives and friends of the White Rose try to avert the enforcement of the death sentence with clemency pleas. All pleas are denied stating the reason that theirs is “probably the most severe case of highly treasonous leaflet propaganda”. Hans Leipelt goes to Hamburg in April 1943. He hands the leaflet to his sister Maria and dissidents he knows who duplicate and distribute it further. In late summer, Hans Leipelt and Marie-Luise Jahn collect money for Kurt Huber’s family who is destitute after his arrest. Someone denounces them, and they are arrested in October 1943. The Gestapo now terrorizes Hans Leipelt’s relatives and friends and other dissidents in Hamburg. Hans Leipelt is branded as a “Jewish Half-Breed” according to the racist Nuremberg Laws of 1935. He is expelled from the Wehrmacht for this reason in 1940 although he had been distinguished for his military service in Poland and France. His discharge from the army is deeply hurtful to him. He begins to study chemistry at Hamburg University in the winter of 1940 but because of anti-Semitic harassment there he transfers to the more liberal chemical institute in Munich under Nobel laureate Prof. Heinrich Wieland the next year. The ‘People’s Court’s’ trial against Hans Leipelt, Marie-Luise Jahn and five fellow campaigners takes place in Donauwörth on 13 October 1944. The death sentence is requested for Leipelt and Jahn on the grounds of “preparation of high treason”. In a break at trial, Hans Leipelt asks Marie-Luise Jahn’s defense lawyer to incriminate him and save his girlfriend’s life. Her death sentence is changed to twelve years’ imprisonment. Leipelt himself is condemned to death and decapitated at Munich-Stadelheim on 29 January 1945. Three of their friends receive prison sentences, two go free. Further trials follow suit in Munich, Saarbrücken, and Hamburg. All pleas for mercy are rejected. A trial for “failing to report a planned act of high treason” against Manfred Eickemeyer, Josef Söhngen, Wilhelm Geyer, and Harald Dohrn takes place in Munich on 13 July 1943. It is the same day that Kurt Huber, Willi Graf, and Alexander Schmorell are executed. The architect Eickemeyer’s atelier had been a meeting point of the resistance group. They hid suspicious documents in the basement of Josef Söhngen’s bookstore. Söhngen is sentenced to six months in prison for possession of two of the White Rose leaflets. Eickemeyer, Geyer, and Dohrn are discharged. Willi Bollinger in Saarbrücken is sentenced to three months in prison for “failure to report an act of high treason” on 03 April 1944, the prosecution cannot prove his own involvement in the White Rose resistance activities. Willi’s brother Heinrich and Helmut Bauer had been condemned to seven years in penitentiary on 19 April 1943. German newspapers inform the public about the death sentences pronounced in the first trial on 23 February 1943. They vilify the three students as ‘traitors’ and maintain the same tone in their reporting about the second trial. Munich citizens who happen to have the same names as the condemned publish newspaper ads dissociating themselves from the White Rose members whom they were “not related to or acquainted with”. The foreign and the German exile press on the other hand honor the resistance group and publicize the events around it heavily in hopes of helping to spread the student protests. The first information about the White Rose makes its way to Norway and Sweden in March 1943. Helmut James Graf von Moltke, one of the leaders of the Kreisauer Kreis resistance group, hands over a report of the events in Munich and one of the White Rose leaflets to bishop Eivind Berggrav in Oslo. The report is distributed in Scandinavia and Great Britain and is an important source of information for foreign reporting. British and Soviet German-language radio programs feature information about the Munich resistance group in 1943. The German writer-in-exile Thomas Mann honors the White Rose’s resistance in the BBC radio show “Deutsche Hörer” (“German listeners”). The Royal Air Force drops several million copies of the sixth leaflet over Berlin, Dortmund, Düsseldorf, Köln, Münster, and Weimar between 03 and 25 July 1943. The Soviet leaflet “Senkt die Fahnen” (“lower the flags”) uses information about the resistance and the retaliation against the White Rose in June 1943. It calls on German soldiers to lay down their weapons. The International Student Assembly holds a rally at Hunter College Play House in New York on 02 August 1943 in honor of the student resistance in Munich. Speakers include first lady Eleanor Roosevelt, renowned journalist and author Dorothy Thompson, and the German émigré Paul Hagen, Research Director of the “American Friends of German Freedom”. The first commemoration for the White Rose takes place as early as 04 November 1945 in the Munich Schauspielhaus theater. The minister of culture Franz Fendt, first mayor of Munich Karl Scharnagl, and religious philosopher Romano Guardini honor the “death-defying bravery of the young people” for their attempt “to awaken the German people from its lethargy.” A tradition of public commemoration of the White Rose resistance group takes hold in Munich and other German cities. As of 1945 the press also begins to remember the group’s actions. In both parts of Germany, streets, squares, and public institutions are named for the members of the resistance group. In Germany today, more than 200 schools carry their names, especially that of the Scholl siblings. Internationally as well as nationally, the White Rose is one of the most famous resistance groups against the National Socialist regime. It is a model of civic values both in Germany and abroad. Movies are particularly impressive in shaping our image of the White Rose. A growing number of biographies helps keep the memory alive. Over time, the resistance of the White Rose, their motives to act, and their courage have been interpreted differently and have been considered to hold different messages for the respective present times. The breadth of interpretation ranges from Christian martyrdom and strictly ethical idealism to models of politically motivated resistance and civil disobedience. Literature has also taken up the White Rose as a subject. Alfred Neumann wrote “Six of Them” in exile in America as early as 1943. “Seven Were Hanged” by William D. Bayles appeared in England in 1945. The author Ricarda Huch published newspaper ads to call for testimonies and collect information about the German resistance, including that of the White Rose, for her last book project in 1946. Relatives published books in memory to those who had been murdered, as did Clara Huber in 1947 and Inge Scholl in 1952. Scholl’s book “The White Rose” has posthumously imprinted both the name of the resistance group and, for decades, the way it was remembered. Her book’s outstanding success is partly behind the fact that popular memory to this day strongly associates the White Rose mostly with the Scholl siblings. Alexander Schmorell was glorified as a saint by the Russian Orthodox Church on 04 February 2012. Those detained in Hamburg are not listed here.